The Ski School Colfosco, thanks to the construction of the new headquatrers, has achieved the status of Mountain Sport Resort. The combination of Ski School, Ski Storage and Bistrò, together with a stategic position near to the lifts of Borest, Colfosco and Sodlisia, on the Sellaronda no less, make the Mountain Sport Resort Colfosco an ideal choice for skiers in that they can find all they need in one location. An ideal collaboration with ski hire outlets and with accommodation providers add to the service so as to make a real complete offering. The structure is also a “breath of fresh air” and a real incentive for all the ski teachers at the Ski School Colfosco. Relax on the slopes and relax too after you have finished for the day: in our ski storage lockers you can leave all your gear overnight and find it in prime condition the next morning – this thanks to a warm heating system installed. Skis, poles, helmet, gloves, boots can all be left in the locker and there is space for either one or two persons equipment or even space for that of the whole family. Ask for information and find out more about our hire offers and storage space arrangements. 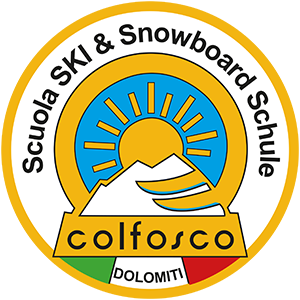 A proven professional approach, and opportunity for lots of fun on the slopes – this one of the fundamental aspects for ski teachers at Ski School Colfosco. Be you beginners, more advanced or real expert skiers we have the solution here for you! A super meeting place for young and not so young alike. Great for breakfast or just a snack, and nearer noon a nice hot dish served up quickly so you can get back on the slopes nice and quick. Or just take it easy here and watch your friends and kids on the slopes, while enjoying our bistro terrace. Check out our events calendar too: fun and relax are here for you!